The Van Briggle Pottery was founded in Colorado Springs, Colorado in 1901 by Artus and Anne Van Briggle. The Van Briggle Pottery they established continued production of pottery for over one hundred years, and was until the company’s closure in 2012 the oldest continuously operating art pottery in the United States. The Van Briggle Pottery was noted for its Art Nouveau styles, Arts and Crafts colours, distinctive matte glazes, and its floral, figural and tiles of Anne Van Briggle. The Van Briggle’s pottery were awarded high honors from prestigious sources, including the Paris Salon, the Saint Louis Exposition, the Lewis and Clark Centennial Exposition, and the American Arts and Crafts Exhibition in Boston. 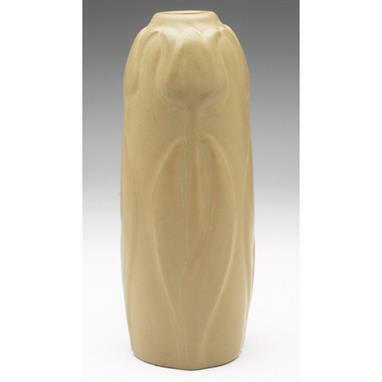 Artus Van Briggle was born on March 21, 1869, and his family lived in Ohio which was one of the main areas for ceramic design in America featuring potteries such as Roseville, McCoy, Weller, Hull and Rookwood to name a few. It was in fact Rookwood Pottery where Artus was destined, after first attending the Cincinnati Art School and later a position at the Avon Pottery where he was initially introduced to the ceramic arts. His skill and talent were recognized by Rookwood founder, Maria Storer, who became his benefactor, even sending him to France to study art at the Académie Julian in Paris. Whilst in Paris, Artus was exposed to new styles of art and techniques and took a great interest in an early matte glaze from the Chinese Ming Dynasty; a type that was lost to history. It was also in Paris where Artus met his future wife, fellow American student Anne Lawrence Gregory, an accomplished artist in her own right. Artus and Anne returned to America in 1896, where he continued at Rookwood experimenting with recreating the lost Ming Dynasty glazes. Artus was to eventually develop the “matte glaze” used at the Rookwood Pottery. This was a flat but textured glaze, often painted on soft colored clay, which used “sea green” for aquatic and floral motifs. 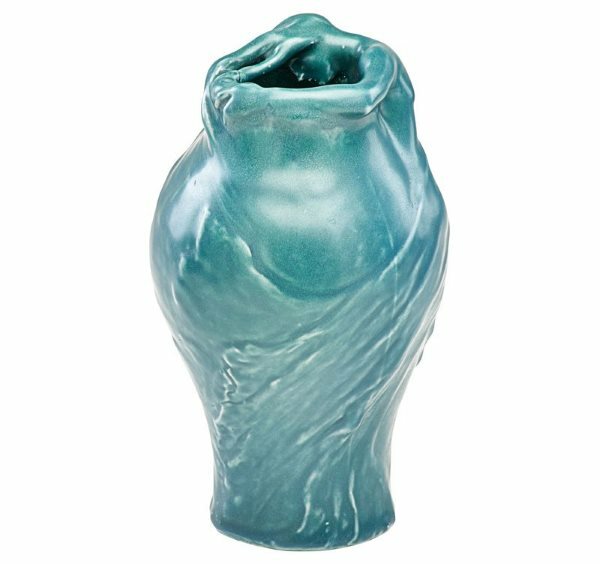 This pale blue-green glaze was usually applied over a soft yellow, bluish or red base. Artus left Rookwood Pottery in 1899, suffering with tuberculosis, and moved to Colorado Springs. Whilst in Colorado he was able to develop his Art Nouveau influenced pottery and after two years of trials and experimentation he perfected his matte blue glaze based on an ancient Chinese process that had long been lost to history. 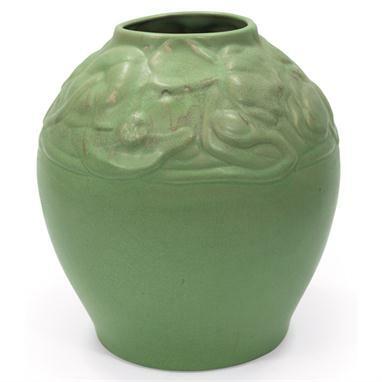 With his new glaze and graceful Art Nouveau designs, Artus opened The Van Briggle Pottery in 1901. He was joined by Anne Gregory and they married in 1902 who was to have a major input in all aspects of the pottery as well as design. Van Briggle’s pottery and designs received national and international acclaim and in Europe’s the were proclaimed, “A supreme discovery in modern ceramics.” Artus and Anne established hundreds of Art Nouveau styles of pottery under the Van Briggle name. 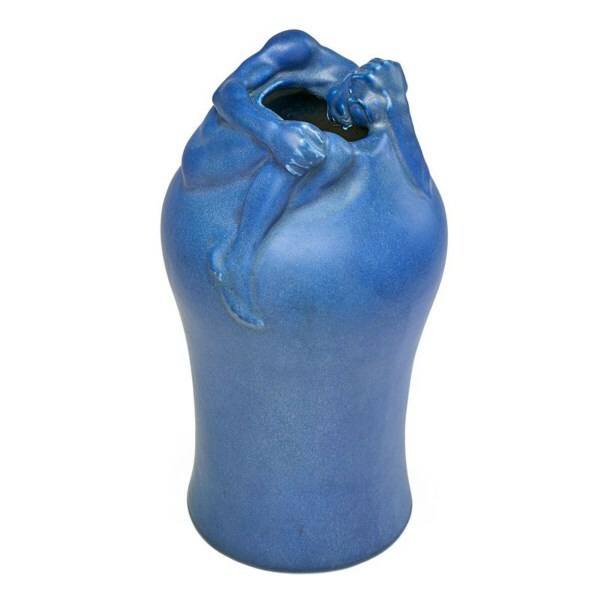 The Despondency vase won Van Briggle wide acclaim and first place at the Paris Salon in 1903. A display at the 1904 Centennial Exhibit in St. Louis won Van Briggle more awards and greater international fame. Artus Van Briggle died in July 1904, at the age of 35. Anne continued the pottery using the forms created by Artus as a foundation and adding more designs of her own. It was only after the death of Artus that the company started making hand pressed tiles. The tiles featured Arts and Crafts and Art Nouveau designs. The tiles were very popular, especially among local builders who used them in the booming Colorado housing market and the tiles also decorated the facade and interior of the new pottery (designed by Dutch architect Nicholas Van den Arend) that was opened in 1908. Production of tiles at the pottery continued until 1920, with most of the limited production being for architectural use. For collectors access to Van Briggle tiles is limited and when do they appear at auction they achieve good prices. For collectors it is the early pieces that command most interest and highest prices for collectors notably the work of Artus. Early production was always limited and ‘one prominent collector has suggested that only about 400 pieces total were made prior to his death‘ (Rago and Perrault). Although the Van Briggle Pottery continued production for over one hundred years in one form or another according to Rago and Perrault the last pieces of collecting merit date to 1932. Pieces attributed to Artus and Anne can sell for many thousands of dollars – the record price for an attributed Artus piece is his classic prototype Lorelei piece whilst he was a decorator at Rookwood. The 7 1/2-inch-tall vase is incised ‘A. Van Briggle 1898,’ and has a Paris Exposition Universelle 1900 label sold for $187,500 at Rago Arts and Auction Center’s 20th Century Decorative Arts and Design Auction in June 2016.